Approx 0.9ha in size with 2m high walls surrounding the churchyard is another area that will be taken into account during the redevelopment phases of the project within a wider scheme of plans to make more visible site-lines, improved interpretation and potentially re-landscaping. Most importantly the idea to provide and create a more direct and attractive route between the estates and High Street, making the churchyard more integral to the life of the area. Maintained by Lewisham council but managed by the church, it is a deconsecrated space and not used for burials, though an area on the west side is in active use as a memorial garden. Anti-social behaviour has been a major issue, with rough sleeping, damages to the building and drinking but this has been reduced in recent years although there is still a definite need to address this within the redevelopment. 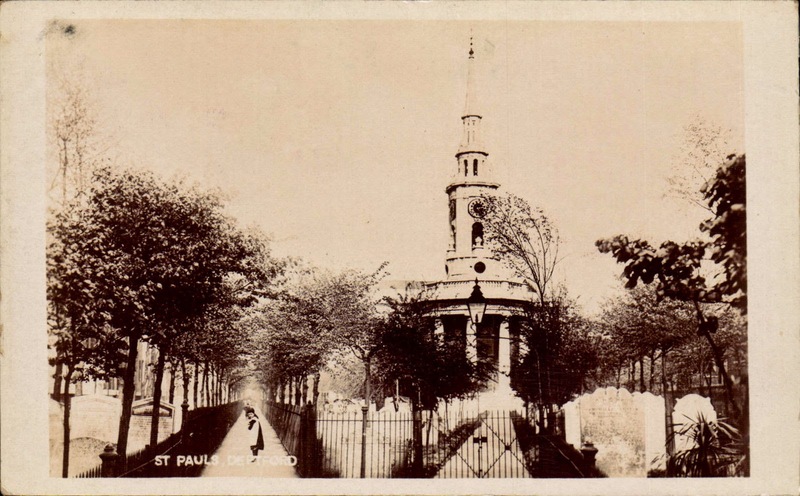 The site, originally chosen for S. Paul’s Church, in the 1700s was owned by Henry Wise, the Royal Gardener, who sold it in 1710 to his brother Richard, a master caulker (a profession involved in making a ship watertight) in Deptford, who then sold it to the Commission for £640. At that time the land was used as a market garden by Samuel Preistman who was compensated £80 for loss of fruit tress, asparagus plants and dung! Five houses along Church street boundary were demolished. By 1852 the burial ground was closed following the London Burial Acts as it was deemed a health risk due to overcrowding. It reopened again in 1856 but eventually closed in 1858. Some tree planting followed in the 1890s and in 1910 an Act of Parliament converted the burial grounds into public gardens. The headstones were moved to the perimeter and walks laid out with trees planted alongside. Today the whole churchyard site is walled with railings and gates and features a forecourt at the main entrance adjoining Deptford High street re-landscaped by Alan and Sylvia Blanc in 1973. There are many fine monuments in the churchyard which include: a Roman burial tomb (date to be confirmed) at the main entrance, table-tombs linking to individuals associated with the naval history, such as a grave of Mydiddee, a Tahitian who came to England with Captain Bligh on HMS Providence and who died in Deptford in 1793. There is an obelisk at the east of the churchyard to the Stone family of 1807, along with a charnel house that is no longer in use. What I find most interesting about the churchyard is that it was the first churchyard to be converted into public gardens in 1912 when the headstones were moved to the perimeter. Additionally there was also a rectory house (1717) belonging to S. Paul’s Church was located next to the church but was demolished and replaced by terraced housing in the 1800s. These buildings were then bombed in The Second World War and in the 1970s the site was cleared and has not been altered since. Lawn to the East of St Paul’s Churchyard at junction with Deptford Church St. and Coffey St.
Sue Godfrey Local Nature Reserve to east beyong Deptford Church St.